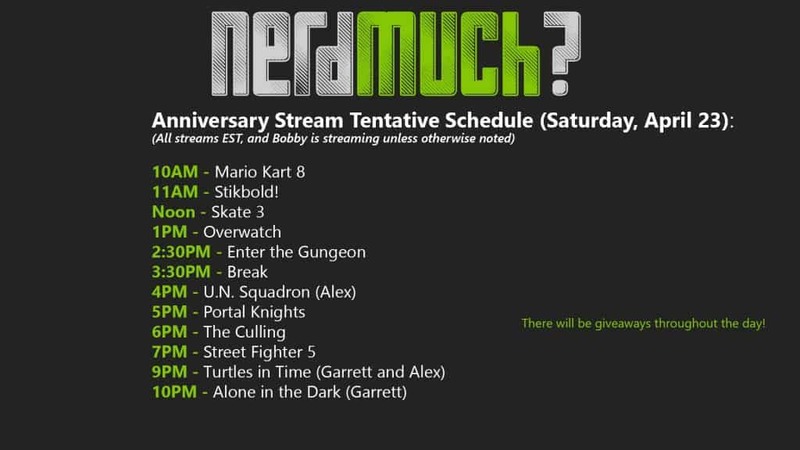 Saturday Twitch Marathon: Celebrate Our 1 Year Anniversary | Nerd Much? 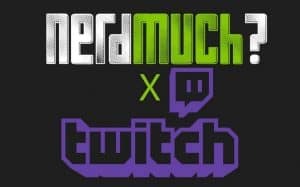 We’re coming up on our official one year anniversary, and we’ve decided to announce the official Nerd Much Twitch by having a Twitch marathon in celebration. On Saturday, April 23, Nerd Much will turn one year old, and we will debut our official Twitch starting at 10 AM EST, streaming the latest games, indie gems, and retro classics spanning the PS4, Xbox One, Xbox 360, PC, SNES, N64, and more. There’s no telling when the stream will end, but we’re planning to go wee into the late night hours with our fans. Over the past year, we’ve grown from a goose egg to over 205K monthly views, and we’ve hit 1 million pageviews so far. Obviously, we’re looking to grow, and grow we shall. 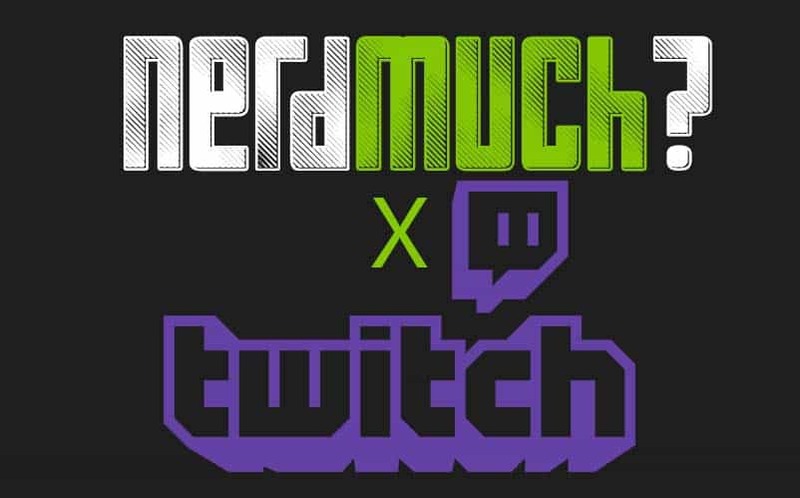 But more importantly, we’re looking to create a sense of community here at Nerd Much, and interacting with our frequent readers and fans on Twitch is the next step to do that. You’ve probably already seen us in random Twitch chat rooms around the web (we frequent Easy Allies, Kinda Funny, and GlydeTV to name a few). Now, it’s our turn to interact with our fans. Not only will we be streaming our hearts out, but we’ll also have some great merch to giveaway, thanks to some of our partners in crime, including a Plantronics Rig 500HS Camo Headset, a Game of Thrones Season 5 Blu-Ray, some game codes (including 505 Games’ Portal Knights), some nerdy clothing, and tons more (we’re still accumulating stuff all week). So, who will be streaming and what will be streamed? I (Bobby) will be doing the majority of the streaming, but our other content creators are getting involved as well, of course. Garrett and Alex will have their own streams, and Collin might be able to stream with us as well. Definite games include Street Fighter 5, Overwatch, Enter the Gungeon, Skate 3, U.N. Squadron, The Culling, Rocket League, Portal Knights, Knight Squad, Stikbold!, Mario Kart 8, and more. Also, we’ll probably host a chat about this week’s big news. I’ll nail down specifics by Friday and post an official schedule here, so stay tuned. So come join us on Saturday on Twitch, and be sure to tell your friends to as well. We’re going to stream whether the room is empty or whether it’s full, but we’re hoping our readers will show up and say hi, at least. We look forward to seeing everyone on Saturday!